Colonel Qaddafi, who was a 27-year-old junior officer when his coup deposed King Idris in September 1969, viewed himself as a desert philosopher, and he declared that his political system of “permanent revolution” would replace both capitalism and socialism. But over the years, that revolution also swept away nearly every institution that could challenge him — or guide the country when he was gone. By the time he was done, Libya had no parliament, no unified military command, no political parties, no unions, no civil society and no nongovernmental organizations. His ministries were hollow, with the notable exception of the state oil company. By Wednesday, rebels tried to tighten their control over the country, putting a nearly $2 million bounty on his head and sending fighters toward one of his last strongholds, Surt. The uprising condensed into six harrowing months an ever more destructive version of the erratic rule that Colonel Qaddafi imposed on Libya over the previous four decades. He clung to power and refused to accept the rejection of his own people, railing against a spectrum of outside conspiracies from Islamic fundamentalists to rejuvenated colonialism. The country of six million people and vast oil wealth, meanwhile, gradually disintegrated. To ensure his singular role, Colonel Qaddafi had long wielded violence both at home and abroad. He financed and armed a cornucopia of violent organizations, including the Irish Republican Army, the Red Army Faction in Europe and African guerrilla groups. His government was linked to terrorist attacks, most notoriously the explosion ofPan Am Flight 103 over Lockerbie, Scotland, in 1988. He became an international pariah. Colonel Qaddafi terrorized and intimidated Libyans by spasms of violence at least once a decade. In the late 1970s and early ’80s, he eliminated even mild critics through public trials and executions. Kangaroo courts were staged on football fields or basketball courts, where each of the accused was subjected to intense interrogation, often begging for mercy while a crowd howled for death. The trials were televised live to make sure no Libyans missed the point. The bodies of one group of students hanged in downtown Tripoli’s main square were left there to rot for about a week, opposition figures said, as traffic was rerouted to maximize the number of cars forced to pass by. In the beginning, though, he brought them relative prosperity. Libya had been desperately poor, living off the meager proceeds from exporting scrap metal left over from major World War II battles until oil was discovered in 1959. But a decade later, Libyans had touched little of their wealth. The 1969 coup changed that. The new Libyan government forged a profound global change in the relationship between the major oil companies and the producing countries, forcing the oil giants to cede majority stakes in exchange for continued access to Libya’s oilfields. Libya also demanded a higher share of the profits. The pattern was emulated across the oil-producing states. With the increased revenue, Colonel Qaddafi set about building roads, hospitals, schools and housing. Life expectancy, which was 51 in 1969, is now over 74. Literacy leapt to 88 percent. Per capita annual income grew to above $12,000 in recent years, though that is markedly lower than the figure for many countries endowed with vast oil income. 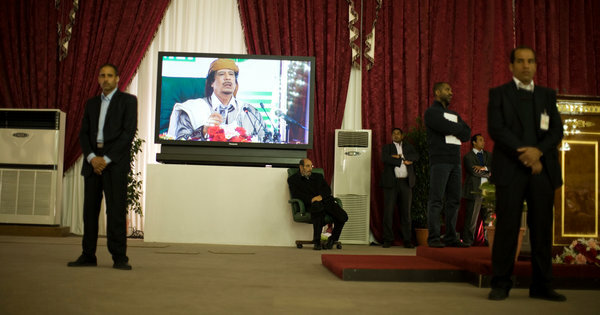 But Colonel Qaddafi’s mercurial changes in policy and personality kept Libyans off balance for much of his rule.